Stewart Grant is a composer whose music is rooted in his long-abiding interest in yoga and meditation, his love of nature and his many years of experience as a conductor and oboist. It draws upon a wide variety of influences – from baroque to jazz, from Mahler to medieval – and fuses them into a style which is contemporary, personal and distinct. Stewart Grant was born in Fort William, Ontario, but he grew up and received his early musical training in Montreal, graduating from the Faculty of Music at McGill University and the Conservatoire de musique du Québec, where he was awarded a Premier Prix in oboe in the class of Melvin Berman. His studies also included summers at Tanglewood, at the Aspen Music School and as a member of the National Youth Orchestra of Canada, where he studied with Ray Still, principal oboist of the Chicago Symphony. While still a student, Mr. Grant organized and directed a chamber orchestra comprising students from both McGill and the Conservatoire de musique du Québec. Upon graduation, he joined the faculties of both of these institutions and began his career as an oboist, performing with the Montreal Symphony Orchestra, l’Orchestre de Radio-Canada, and Les Grands Ballets Canadiens. In 1972, Mr. Grant joined the National Arts Centre Orchestra in Ottawa, and it was during his two seasons with this organization that he decided to pursue a career as a composer and conductor. He subsequently moved to Toronto, where he performed as an oboist with the Canadian Opera Company, the National Ballet, the Hamilton Philharmonic and the St. Andrew’s Consort while pursuing studies in composition and jazz arranging with Gordon Delamont. In 1978, Mr. Grant was named Music Director of the Lethbridge Symphony Orchestra in Alberta. Over the sixteen years he held this position, he developed the Lethbridge Symphony into what was considered by the Canada Council to be a model for semi-professional orchestras across the country – establishing Musaeus as its resident professional chamber ensemble, founding the Southern Alberta Chamber Orchestra, and expanding the season from seven to a total of approximately sixty performances of various kinds per year. During his years in Lethbridge, he continued to develop as a composer in an ideal situation where his writing was part of his normal activities within the community. He also appeared as a guest conductor with orchestras in both Canada and the United States while remaining active as an oboist and pedagogue, teaching both in Lethbridge and at the biannual Canadian Festival of Youth Orchestras at the Banff Centre, and presenting countless performances and broadcasts as a member of Musaeus throughout Alberta and as far afield as the former Soviet Union. In 1988, in recognition of his many accomplishments in Lethbridge, he was presented with the Heinz Unger Award at the national conference of the Association of Canadian Orchestras. Since returning to Québec in 1995, Mr. Grant has composed commissioned works for various artists and organizations, including the Montreal Symphony Orchestra, the Canadian Chamber Choir, Les Jeunesses musicales du Canada, the Banff International String Quartet Competition, l’Orchestre de chambre de l’Estrie, pianist Paul Stewart, violinists Martin Beaver and Richard Roberts, l’Orchestre de chambre Appassionata, Le Quatuor Claudel, the saxophone quartet Saxart, and the Ayorama and Estria Wind Quintets. He has performed as guest conductor and oboist with various orchestras, at the McGill University Faculty of Music and on the National Arts Centre Orchestra’s chamber music series at the National Gallery. As a member of the duo Jaï – which he formed with ‘cellist Joanne Grant – he has performed numerous concerts and produced a CD with organist Patrick Wedd. From 1999 to 2017 he was Artistic Director of the West Island Youth Symphony Orchestra, with whom he produced three compact discs and toured France, Italy, Switzerland, Austria, the Czech Republic and Western Canada. Music Director of the Lakeshore Chamber Orchestra since 2009, for the 2004-05 season he was Artist-in-Residence for the Centre culturel de Pointe-Claire, Stewart Hall. Over the course of his career, Stewart Grant has also written for ensembles such as the Edmonton Symphony Orchestra, the Regina Symphony Orchestra, the Hamilton Philharmonic, The Thirteen Strings of Ottawa, The Foothills Brass and the Saskatoon Sinfonietta, as well as for solo artists such as pianists Charles Foreman and Glen Montgomery, organist Dom André Laberge and contralto Maureen Forrester. His compositions have been performed by orchestras such as the Vancouver Symphony Orchestra, the Israel Chamber Orchestra, I Musici de Montréal, the National Youth Orchestra, the Saskatoon Symphony Orchestra – for whom he was “Composer of the Season” for 1995-96 – Les Violons du Roy, the McGill Chamber Orchestra and the Calgary Philharmonic, and also by artists such as pianist Stéphane Lemelin, violinist Andrew Wan and James Sommerville, principal horn of the Boston Symphony Orchestra. His music has been frequently broadcast across Canada on CBC Radio and has been performed in Europe, the United States, India, Taiwan, Mexico and South America. His works are available through the Canadian Music Centre and the Theodore Presser Company. In 2010, Stewart Grant was awarded the Prix de musique of the Association des orchestres de jeunes du Québec in recognition of his dedication to the cause of youth orchestras in Québec, and in 2012, he received the Queen Elizabeth II Diamond Jubilee Medal in recognition of his contribution to the musical life of the West Island area of Montreal. The year 2001 saw the release of Sharing Visions, an award-winning television documentary based on Stewart Grant’s Sam Black Sketches that explores the creative process both from his perspective as a composer and from the perspective of B.C. artist Sam Black. The film culminates in a performance of the work by the Edmonton Symphony Orchestra. for Symphony Orchestra 20:00 2(Picc.) 2(E.H.) 2 2 – 4 2 3(B.Tbn.) 1; Timp. 2Perc. Pno. Str. for String Orchestra 7:30 Str. 20:00 3 2 2 2 – 4 2 3 1; 3Perc. Cel. Hp. Str. 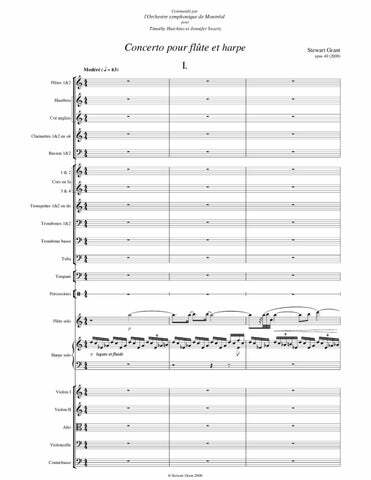 for Orchestra 11:00 2 2 2 2 – 2 1 0 0; Perc. Str. 15:00 3 1 2 2 – 4 2 3 1; Timp. 2Perc. Str. “Et in terra” 21:00 2 2(E.H.) 2 2 – 4 2 3(B.Tbn.) 1; Timp. Str. 22:10 Fl. Hp. soli; 2 2(E.H.) 2 2 – 4 2 3(B.Tbn.) 1; Timp. 2Perc. Str. Perhaps the most interesting work was “Ballade,” which was composed last year by Stewart Grant. A complex piece with lots of contrast and tension, “Ballade” was ripe with romance, vigor and drama. 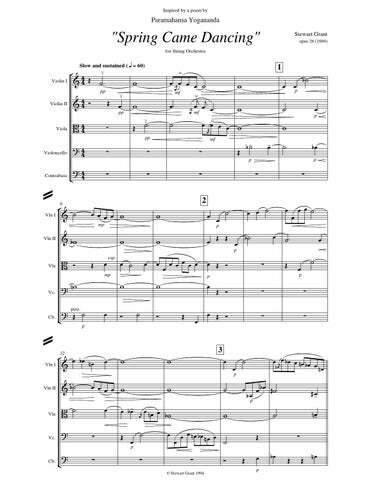 Well done…with important solos for each instrument, a nice dialogue between the two, dramatic gestures and shadow play even for the flute, a beautiful orchestral framework. And magnificently played by all. 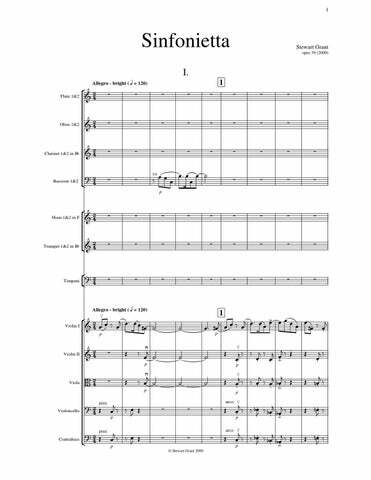 …showed how effectively older forms can be melded with contemporary, even jazz-influenced musical nuances to produce a striking, challenging statement. String bass rhythmic impulses were particularly prominent, echoed by pizzicato responses from the smaller stringed instruments, as the moods quickly built, tapered and evolved. Set upon blues-oriented subjects reminiscent of late Gershwin and early Bernstein, the piece astounds by being tight and viable. All the right tensions and releases play off each other and Grant has a firm hold on writing not only solidly, but weightlessly. 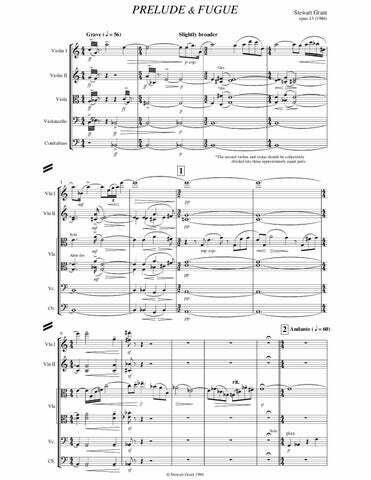 …a marvelously subtle and substantial score. This concert was definitely educational and made me wonder why so little is written about Canadian music in our music appreciation and music history books. 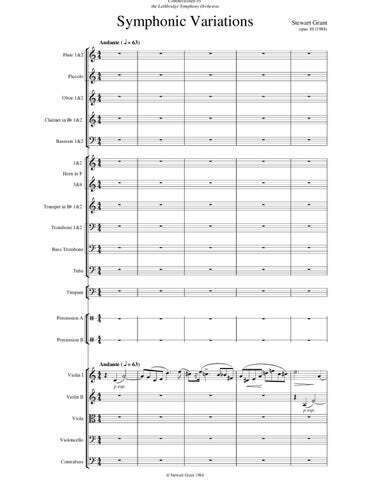 With composers like Stewart Grant who can cook up such interesting orchestration, you can be sure more than a few sentences and paragraphs will be written in the future. Stewart Grant is a Canadian composer who is going places… Grant knows how to handle orchestral color, and in these variations he manipulates his material with great ingenuity. This is a work with a future.